5 segments of .925 Silver. 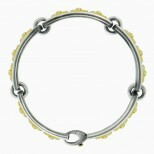 Shiny silver finish with shiny gold accents with a lobster claw. 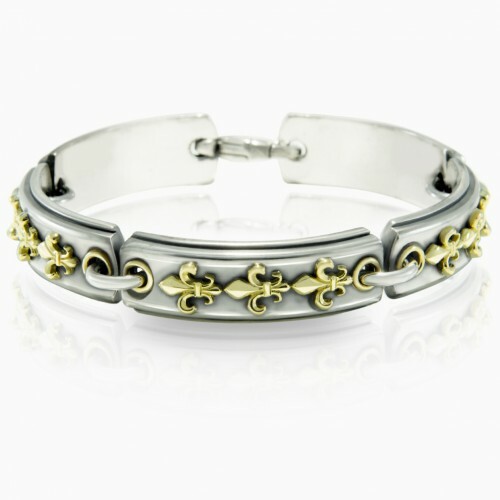 18 k Yellow Gold fleur de lis accents, three fleur de lises on each link with 18 k Yellow Gold eyelets. Each segment is 35 mm long (almost 1 1/2 inches), and 11.3 mm wide (1/2 inch). Total length of bracelet 7.5 inches. 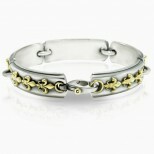 Solid and heavy bracelet.